The term holds so much weight within our culture. But the beings from which this measurement is taken express virtues far more potent than the mere strength and speed held within their bodies. Their true, hidden power exists within a realm that you can only reach through feeling~ and that you can only fully experience with a deep belief in your most wild magic. This is a magic far older than words…and it is spoken directly from the Heart. 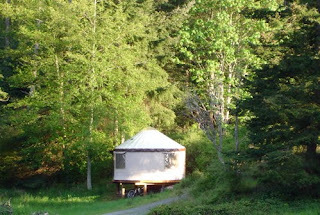 My whole life I have secretly longed to hear those silent voices communicating within the forest; to comprehend the infinite ribbon of song woven throughout all of Nature. I have cried at the feet of trees, knowing that their messages were just outside of my mind’s ability to listen and understand. There is grief in remembering how much we have forgotten. Slowly, over time, I had convinced myself that such miracles were meant solely for some rare and chosen few. Until a few weeks ago~ when a big, shy Mustang named Black Elk (along with his loving “mother” Kate) shattered this belief upon one of the most amazing journeys of self-discovery that I have ever experienced. As is the natural way with these gentle giants, Black Elk called me into my highest human qualities… and would allow no less. Only when I stood in my fullest presence~ radiating an empowered sense of unconditional love and self-respect~ would he offer his trust, and follow my lead. I began to explore the invisible tether between our energetic bodies~ which at first was almost too intense, and on the verge of excruciating. To feel on levels that have been shut down for so long, was to almost feel too much. But after those first waves of sensation passed, there remained only a subtle “knowing”…. along with a timeless peace and grateful adoration that extended to this sacred being, and so to all of life. The true gift of this adjusted ability to “tune in” would continue on for hours after a session, without any effort. I could touch into anything upon which I set my awareness… and to my heart’s greatest delight, I began to hear the world speak. With a quieted mind, I felt the earth’s song. I felt the Universe moving in the Dragonfly….. And I was happy. All Blessings to the Horse Nation ~ May their true gift to humanity never be forgotten. for many years. Like Carolyn, I was drawn to mustangs, and taught by mustangs, but these mustangs were in my front yard and the meadows surrounding my house on Orcas Island. while once wild, now they were becoming gentle and used to people, especially me. 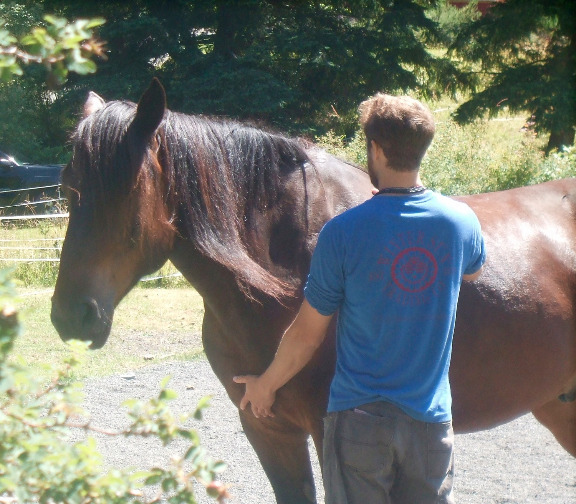 I had totally changed the way I was working with horses, focusing on relationship and draw, and looking for their willingness and happiness, never wanting to overwhelm them and dominate them as I had been taught. 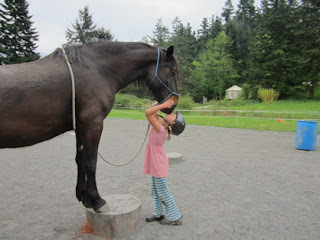 I found when I played with my horses this way, they were happy and I felt joyful and renewed from being with them. When I resorted to the ways I had been taught (in times of frustration) I would feel awful, sick in my heart. I decided I didn't care how long it took to gentle and train and eventually ride my horses, I wanted my horses to keep their happy expressions, their spirits, and allow their personalities to shine. So, I watched them, and I hung out with them, when I asked something of one of them, and they didn't respond, I went softer, asked for less, praised more. I did what I saw the herd leader do, pushing all the horses ahead of him, around the arena. I used treats to gain greater focus. I sang to them. I sat with them as they lay sleeping. I greeted them by name each time I came and went, they called to me if I went off for a walk without them. They came to me when I called, they watched for me and moved towards me on the farm, they looked to me for help when they were hurt or sick. Then, I stumbled upon 'Naked Liberty'. Imagine my happiness to find I wasn't the only one doing things with horses in a unique way, in fact, Carolyn had been forging this path for her lifetime! 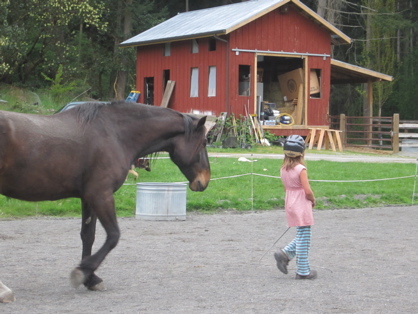 She'd learned from mustangs in the wild, she had been honing her skills since she was a child. I read every blog post she made.. I watched all her videos, I attended seminars with Robin Gates. And I did the work, first with one horse and then another, more with my two main horses, and less with my husband's horses, who are also school horses. This winter in the wet weather, I worked with my 4 mustangs as a herd and less often as pairs. I have been amazed at the changes I have seen in them this spring, as lessons began again, and I started riding. The horse I have been working with the longest, my oldest pal, Rascal is GLUED TO ME whenever I go out he is just right there, at attention, at my shoulder ready and waiting to do what ever I ask. It just blows my mind! When being ridden in dressage, he is also so much lighter, more attentive, forward and anxious to please. Rascal is also a teacher and when I start students on him (only after they get good at all their ground skills and connecting) he is such a good caretaker of all of them. I always give a passenger lesson while walking with Rascal. He is not just good, he is perfect. He is so willing and so engaged that he talks to me, humming and deep rumbles in his throat, nickers. The last lesson I gave with him, he hummed and talked to me the entire hour! I find this the greatest honor, the biggest reward, instead of a dull, turned off horse, wanting to get away from working, Rascal is delighted to be with me and teaching. Yesterday I watched the most amazing connection. Celia, a 7 year old came for her fist lesson. She was excited and totally unafraid. She had to patiently wait while her friend had her lesson, but she played happily and freely on her own. They had made friends with the horses feeding them blades of tender grass as children do, and the horses were very happy to see them. 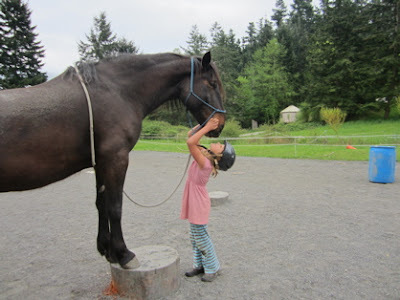 Celia wanted to work with Black Elk, I like to trust a person's intuition, and although I don't normally pair my 1400 lb horse up with a 60 lb 7 year old, that's what I did. He was out on pasture. I always talk to the kids, just like an adult, no talking down. We discussed how to greet a horse and what makes a horse feel safe and not pressured, and what is appropriate in horse culture. We did some hellos and retreats, and then gently we pushed him into the arena. This is how horses lead one another, not with a halter and rope, but by pushing from behind. Cecilia grassed this immediately. 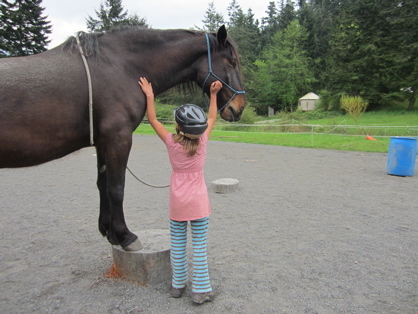 From there we gently learned about haltering and leading, matching the horses energy and then encouraging the horse to match her energy. Walking, stopping, backing up. She was so good at it all! We zoomed through things that many adults take weeks to learn! 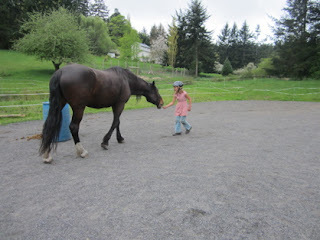 Soon she was circling him at a walk and a trot with ease, with a gentle reminder of a stick on the ground near his feet. He was entranced by her. In between she knew to stop and love him. She gazed into his face, held his cheeks, fed him bits of grass, arranged his body, even picking up his feet. 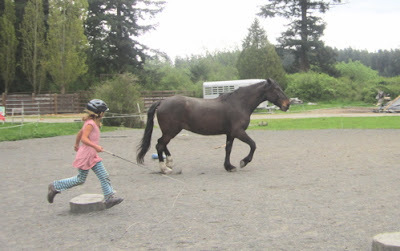 She encouraged him with her energy, she knew without being told to move her feet while circling him and he began to trot, she also bobbed her head. He seemed to fully understand. More and more I just watched the magic unfold. Only offering suggestions for her safety. He loved playing with her. He was entranced. Her mother sighed and said: "Don't you wish we had been taught like this?" At the end of the lesson time, I just let them play. They played for over an hour in a joyful free way that I have never fully experienced or even seen. I have seen people grasp for it and have it for a few minutes, but this was so spontaneous and full of life that I knew I was experiencing something truly rare and wonderful. Fully at liberty, Black Elk danced with this little girl. 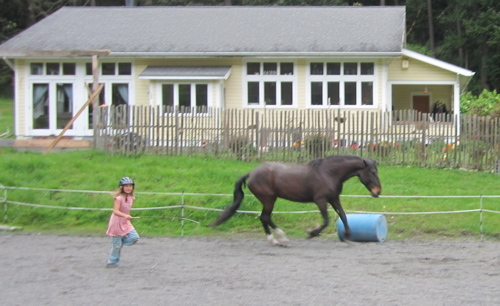 Trotting and cantering, turning and following, up on the stump, time for blades of grass, she played and he played. They were in complete harmony and talk about bliss! When he was turned out to pasture again, she knew to go with him, and pet and coo to him more, while he ate grass. If we could only all be this natural and in the moment, wouldn't life be something? 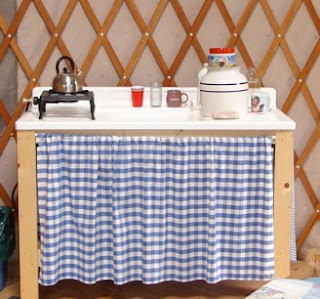 This winter, my boys taught me about being in bliss. Every evening as the light was leaving, I'd head out to be with the herd. I begin by shoveling the arena where they hang out during the day playing with each other, sleeping in the sun, rolling in the sand. As soon as I enter the arena, all the boys would come to me and hover around. I greet each by name. Rascal is always the first to greet me and is soon glued to my side, Shaman is next lowering his head by my knees, Ranger quiet but present, waiting. Usually Black Elk is in the rear, bigger than the rest, trying to push them out of his way. I am honored by their attention. I head down to the far end to begin to shovel, Rascal at my right shoulder, his head perfectly vertical at attention, ears upright curved at the tips, like many mustangs. He stops on a dime when I stop. Shaman full of Spanish Brio and Black Elk at 16-3, built like a war horse, jostling with one another to be on my left side. Shaman, small but strong winning this round. As I move to shovel, each horse steps aside and moves quietly without a word or a touch. I make a game out of it, I back up, they back up, I move towards a hip, and a horse circles, I move toward a shoulder and they turn on the forehand. A few more scoops. Pretty soon I forget about shoveling. I am singing. Different songs, repetitive lines, my energy is shifting. We walk, we waltz, we circle and back up, we cha-cha, all the boys who want do a 'chorus line' with me facing them. I smile and laugh. I sing, I am in bliss. We wander the arena as a herd, matching steps, matching hearts. Black Elk heads to the stump. Look, I can do this he is saying. The competition too fierce for his quiet nature. Yes, standing and waiting is a great trait. A few treats are shared. They are all up on their stumps. They are stumping it, a waiting game, an attention game, eight eyes all on me. I sing. I invite Shaman to circle the others with me. He gets a few pellets, the ones who wait get a few pellets. I back up. They wait. I call them, one by one they come. Rascal and Shaman first, Black Elk slowly leaving the biggest stump taking his long steps to me, nodding his head, feeling like he's grinning. Ranger quiet but persistent, don't forget about me. Travel and Learn about Horses on Orcas Island. 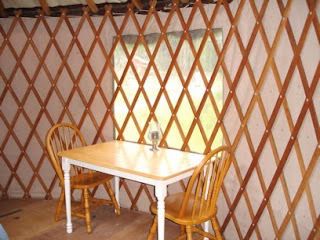 Come stay in our yurt and re-connect with yourself and your loved ones, take some natural horsemanship lessons with our mustangs. "After a 2 hour lesson.. I felt like I had been meditating for a week!" 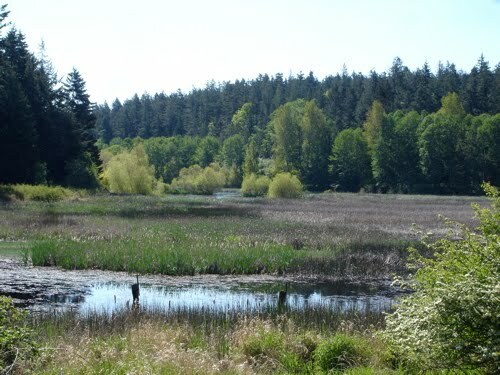 Dawn T. Watch the birdlife in the meadow and adjacent waterfowl refuge. Frogs will sing you to sleep, mustangs will entertain you, the farm is quiet and peaceful, our guests say it's paradise! Students range from 5 to 65. They come to learn about Connecting with Horses and Natural Horsemanship. This is a great learning experience for those new to horses, those with fear issues, and if you are planning to get a horse. 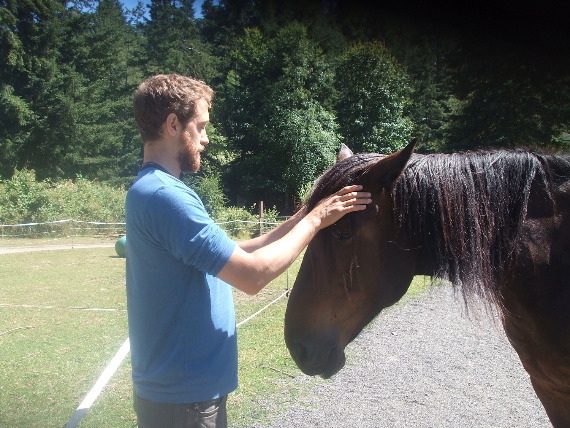 Come spend a week or so, learning about horses, ground skills, liberty work, how to connect naturally. Learn to ride, once you are confident on the ground. Our mustangs are personable and friendly, responsive, respectful and well trained. 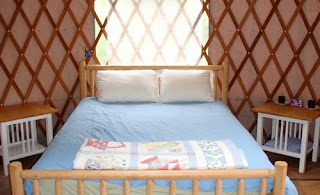 You can snuggle down under a down comforter in our Queen Sized bed and truely rest. 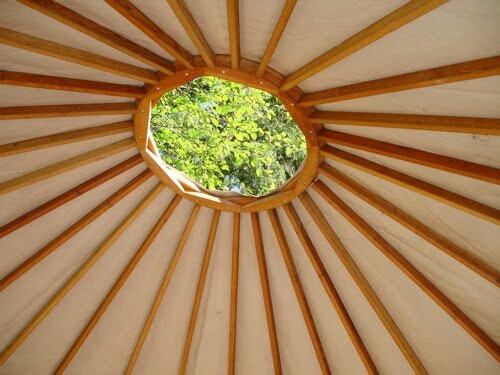 Soft light will glow inside the yurt and you can see the leaves gently moving in the breeze. Love Bird Watching? This is a birder's paradise! 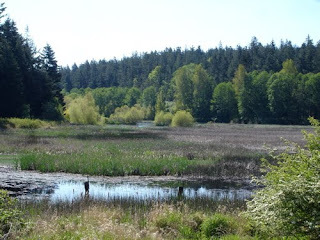 Heron Rookery, all types of water birds, gold finches, eagles, hawks and lots of owls..can be seen on the farm. 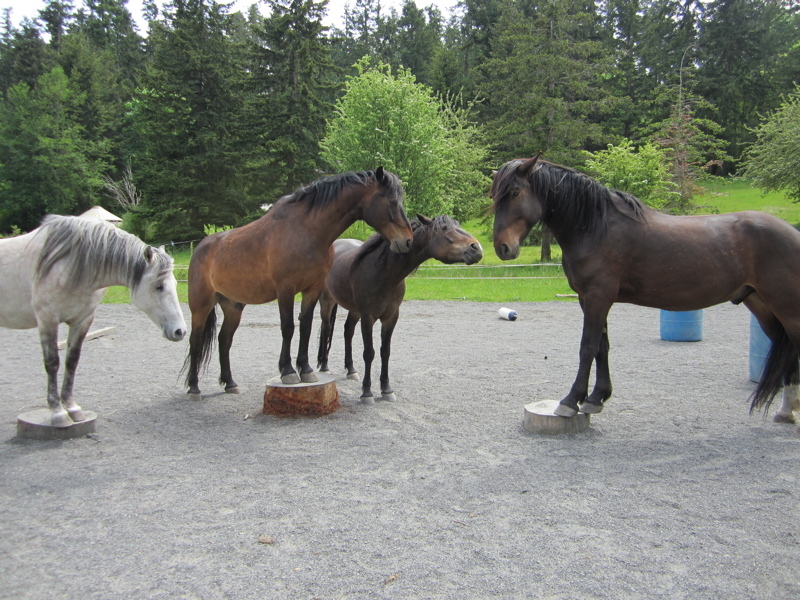 Formerly wild mustangs can be watched while playing and eating in the nearby meadows.